Comprised of 69 wells, the Groundwater System provides drinking water to fewer than 100,000 people in New York City. Residents within the system receive groundwater or a mix of ground and surface waters depending on demand and supply availability. 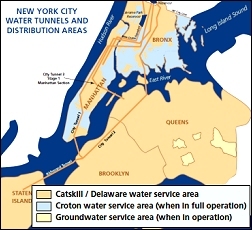 However, in 2010, none of the wells in New York City’s Groundwater System (PWSID NY7003493) were operational. The 69 wells which comprise the Groundwater System were not used for drinking water distribution in 2010. These wells are either mechanically inactive, for emergency use only, or have poor water quality. This information is available on the Service Status Table. There were no wells in operation in 2010; therefore there are no 2010 Groundwater Supplemental data available. Previous years’ data are available at the links provided below.